Imperishable images of Paris. La cité Berryer, off the rue Royale in the 8eme arrondissement, is an ancient mews that had once the feel of a cozy provincial town. Today, renovated, there are rows of impeccable luxury boutiques. In the 1980’s, the mews housed Les Caves de la Madeleine, a wine shop run by Steven Spurrier, an Englishman who shook up the wine world with a blind tasting in ’76 of French and California wines. A few doors down, Steven’s wine bar and bistro, the Blue Fox. The soft clatter of plates; the attentions of the waiter; a girl with bare shoulders; the smell of perfume, and the first sip of a fruity wine – a perfect joining with the sensual world. Fresh from California with patchy French, I gravitated to Les Caves where, in my native tongue, I discovered the incomparable taste of French wines. I had at that time only romantic notions, and scratchy notes from tastings organized by French oenologists. The approach to selecting bottles that Steven revealed at Les Caves was a window to a world of good taste. I envied its simplicity. First, what is the occasion? Entertaining. Aperitif. Lunch. Dinner. A gift. The conversation turned to a particular preference, such as an appellation or a grape variety, and to pairings. Second, what is your budget? Here the key is good value, sometimes referred to a quality / price ratio. For value, there are appellations such as the Côte Chalonnaise in Burgundy, or Vacqueyras in the Southern Rhone. Discover a vin honnête: not a wine of great quality, yet agreeable, an authentic savouring of terroir and grape variety at a low price point. When I think of Steven, I think of France. He knew the world of its wines. I did not. What he provided was certain attitudes toward wine, and cultured manners. A few years before Steven pulled out of Paris in 1988, I relocated to Manhattan. I took up selling wine at an upscale shop off Central Park. I remained obedient to his ways, repeating to customers his phrases like some kind of oath, evoking conversations, charming and riveting. A few months into the gig, I approached a customer at a rack of Bordeaux. She turned toward me: birch-white skin, a full mouth, noisette eyes. “So, what’s the occasion?” She smiled. A long pause. I felt a slight fever coming on. The closeness. I remember the bottle we shared that evening: a Château de Pez. Vintage reports gauge the overall quality of a vintage year (millésime) for appellations. How do weather conditions during flowering, the growing season and at harvest effect the ripening and the maturity of the grapes? On average, what are the alcohol levels, taste, color and mouthfeel, and aging potential of the wines. Of course, there are variances among producers, terroir, grape varieties and vinification. Aperçu. French appellations have long been ranked by quality; the rankings of estates within each appellation is likewise constant from year to year. It is the quality of millésime that determines the fluctuation in “scores” from year to year for particular estates. Don’t think that wine raters start from scratch each year! In a great or good vintage year (’16 and ’15 in the Southern Rhone), quality is higher throughout all price levels. Poor millésimes (’13 Bordeaux, ’16 Burgundy) make for dicey purchases. In France, it’s all about provenance. Estate wines are produced from grapes cultivated, vinified and bottled at the winery. A négociant is a wholesale wine merchant who buys grapes or wines from various producers, and blends and bottles them under his own brand. These wines are known as négoce. The label may state “Mis(e) en bouteille dans nos caves” or “par” (bottled by). Brace yourself. Most wine publications do not indicate the origin of grapes. The reason? Their client is the wine industry. Their objective? Sell wine. Nor is such detail offered on “shelf-talkers” that festoon wine store shelves. Regrettably, full disclosure is not a wine trade custom. An amplification. Négoce wines can offer great value and good taste. One example: Kermit Lynch offers a Côtes du Rhône from the Cave Terres d’Avignon. Négoce wines are “cellar insurance” when entertaining large groups. Likewise, art openings often serve blends from wine cooperatives. That said, journalists sometimes apply the word estate or château to a négoce wine, as do sommeliers. Wine labels are for reading. In the Southern Rhone, wines are predominately blends, called cuvées. Grapes varieties are known as cépages, with Grenache the predominate grape in blends of red wines and rosés. Be curious about the varieties blended, which may be listed on the bottle’s back label. Grenache is married often with Syrah to enhance structure, and with Mourvèdre to heighten aromas and flavors. A single-variety wine or, varietal wine, is called a monocépage. Today, single-variety Grenache is the “tendance” (trendy). I have a penchant for the monocépage (Cabernet Franc) Chinon red wines of the Loire Valley. The ideal serving temperature for red wine is 15-17°C / 59-63°F. When warm, red wine quickly looses it freshness, the alcohol is perceived as out of balance, and if left too long in heated conditions it develops ‘bottle bouquet’ that spikes its nose and flavor. 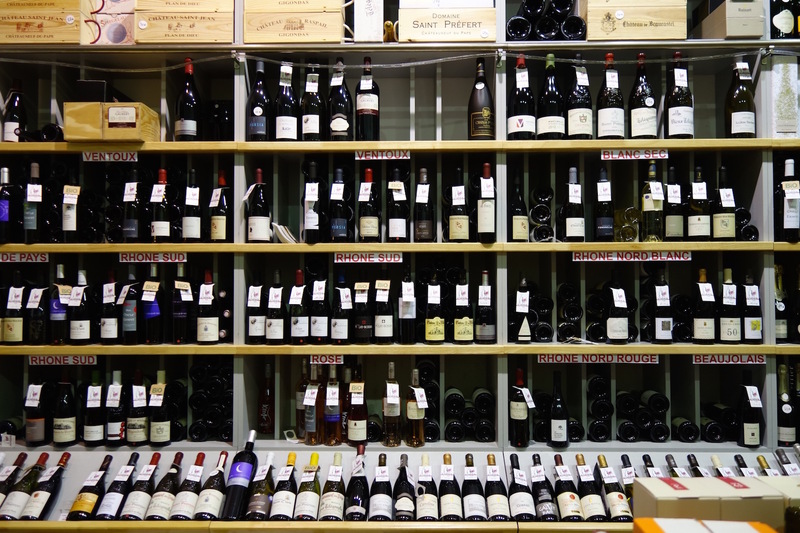 In the Southern Rhone, restaurants and cafés take their daily stock of wine from the cellar, allowing bottles to warm in the bar or dining room. 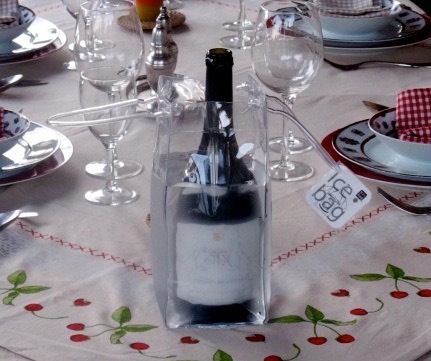 Preserve the freshness and fruitiness of red wine during the entire meal with an Ice Bag. It’s a red wine lover’s accoutrement du soir in the Southern Rhone. Ask a waiter. Many bistros provide Ice Bags on request. The savoir-faire of Steven Spurrier finds its incarnation at Willi’s Wine Bar run by Mark Williamson. Reveling in Willi’s glorious selection of Rhone wines, I renew the lyric of a sensual world.